On February 12, the Circassian website Natpressru.info noted that the administration of the town of Krasnaya Polyana in Krasnodar region moved its town day celebrations, which include concerts, athletic competitions and other events, to May 21. The news outraged many Circassians because May 21 is the traditional date for the Circassian Day of Sorrow. It is believed that on that day, in 1864, the Russian imperial army paraded in the Krasnaya Polyana area, located near the city of Sochi, to celebrate Tsarist Russia’s final victory over Circassian forces. Subsequently, the bulk of the Circassians were forced to leave their homeland; many died of starvation and disease along the way. Natpressru.info’s administrator sarcastically noted that in order to keep the festivities as close to the historical reality as possible, the town should also hold a theatrical parade, in which President Vladimir Putin would play the role of a member of the Russian royal family, while Mugdin Chermit, an ethnic Circassian recently appointed as Sochi’s deputy mayor, would play a “Circassian savage” (Natpressru.info, February 12). Other Circassian activists reacted even more vehemently to the initiative of the town in Krasnodar region. Journalist Sulieta Kusova-Chukho wrote: “This is not even Caucasophobia or a phobia against Circassians. These are acts of sabotage in Russia that are directed at the destabilization of the situation in the south of the country.” Kusova-Chukho pointed to other persistent problems in the Krasnodar region, including a campaign of erecting monuments to Russian emperors and military commanders who subdued the Circassians using especially harsh methods. A monument of General Grigory Zass, known for collecting Circassian skulls, was recently erected in the city of Armavir. Another Russian military commander infamous for his cruelty, Mikhael Lazarev, was honored with a monument in Sochi along with Tsar Alexander II. Kusova-Chukho asked: “Why erect monuments on the soil of the exterminated people and celebrate holidays precisely on the day of sorrow of one of the Russian peoples?” Even more profoundly, the governor of Krasnodar region, Veniamin Kondratyev, hailed the 146 Cossacks who died while defending themselves against a force of 4,000 Circassians during the Russian-Circassian war. Kondratyev then vowed to raise the next generation on the example of those Cossacks. 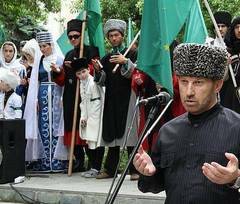 He apparently did not realize that, for better or worse, both Russians and Circassians are now citizens of the Russian Federation, with equal rights (Onkavkaz.com, February 14). Circassian activist Talostan Kertov telephoned the administration of Krasnaya Polyana and spoke to several officials, who denied that they intended to antagonize the Circassians. Another Circassian activist, Aslan Beshto, told the Ekho Kavkaza news service that he did not believe the date of festivities was moved to May 21 unintentionally. The Day of Krasnaya Polyana has been celebrated on the second Sunday of September for the past five years, based on the belief that the first Russian settlers arrived in the area at that time of the year. Circassians also celebrated their Day of Sorrow in the same area on May 21 multiple times, so chances are slim that the officials of the town did not know about Circassian sensitivities (Ekho Kavkaza, February 12). Not surprisingly, the backlash among Circassians was quite widespread. Many Internet users condemned the move as “cynical,” and some Circassian activists even decided to lodge a legal complaint. Although the administration of the town eventually revised their announcement, which now does not mention the specific date of the celebrations in May, the damage was done and, as usual, apologies did not really follow (Kavkazskaya Politika, February 13). The Russian authorities intentionally ignored the historical legacy of Sochi while holding the Winter Olympic Games in Sochi in February 2014. Russian officials, including Deputy Prime Minister Dmitry Kozak, promised to represent Circassian culture in the program of the Olympics, but Moscow instead featured the mythical Argonauts in the opening ceremony and forgot about the real Circassian indigenous population of the conquered territory. Back in the 18th–19th centuries, Moscow tried hard to capture the entire Black Sea and turn it into an internal Russian lake. The Circassians who occupied large coastal areas of the Black Sea were decimated and driven away from the coast. The traces of the historical atrocities are quite visible to this day. Circassians comprise a tiny minority in Krasnodar region, which has access to the Black Sea coastline, and the Circassian population becomes larger the farther away you go from the coast, culminating in Kabardino-Balkaria, a landlocked territory that is the largest Circassian-populated republic of the North Caucasus. While the Russian government continues to ignore the interests of the Circassians and needlessly antagonizes them, some Circassian activists warn that this will have negative consequences. Even though Circassians can hardly afford challenging the Russian government now, they will be in a better position to do so if and when the central government is in flux. Given the history of the Soviet Union’s demise, some observers believe that Russia will go through a similar cycle of disintegration, giving minorities greater opportunities for self-determination and defining their future.